The Gerontological Nurse certification indicates a specialization in providing nursing care for the geriatric population. This includes helping to improve overall health and prevent the possible consequences of chronic disease, as well as involving the patient and family in this educational process. 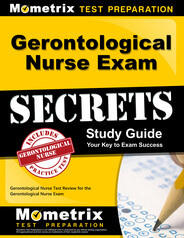 Prepare with our Gerontological Nurse Exam Study Guide and Practice Questions. Print or eBook. Guaranteed to raise your score. Get started today! In order to take the Gerontological Nurse certification exam, the applicant must be a licensed Registered Nurse with an Associate Degree or diploma from an accredited 2-year RN program. The RN must have worked at least 2 years in a full-time capacity as a geriatric nurse, with at least 2,000 hours within the past 3 years. In addition, at least 30 hours of continuing education hours should have been completed in gerontological nursing over the past 3years. The Gerontological Nurse certification exam is offered throughout the year at testing centers across the United States. The RN has 90 days in which to take the exam after receiving the test admission ticket. The fee to take the exam is $230 for members of the American Nurses Association (ANA) and $370 for non-members. Gerontological Nurse Test Flashcards. 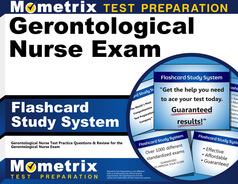 Proven flashcards raise test scores on the Gerontological Nurse test. Guaranteed. The exam consists of 175 multiple-choice questions with 25 of those questions used for pretesting purposes for possible use on future exams. Almost one-half of the exam tests the RN’s knowledge of health issue that the geriatric patient may face. The next largest portion of the exam consists of questions pertaining to some of the normal aging changes and lifestyle changes the elderly patient may experience. The remainder of the exam contains questions regarding the nursing interventions used to treat geriatric patients as well as ethical issues, patient and caregiver education, and health wellness promotion and maintenance. Gerontological certification is valid for 3 years. At the end of that time period, the licensed RN must have completed at least 1,000 hours of employment as a gerontological nurse. In addition, at least 75 continuing education hours should have been completed or other educational activities should have been completed as outlined by the American Nurses Credentialing Center. The fee for renewal is $160 for ANA members and $290 for non-members as long as the practice hour and continuing education hour requirements are met. For those who wish to retake the exam in order to recertify, the fee is $230 for ANA members and $370 for non-members. For more information regarding the Gerontological Nurse certification for the Associate Degree or diploma RN, go to www.nursingworld.org, www.nursecredentialing.org, www.geronurseonline.org, www.ngna.org.